When I came back home from work around 7pm, the first thing that my brother said : "I'm so hungry!". 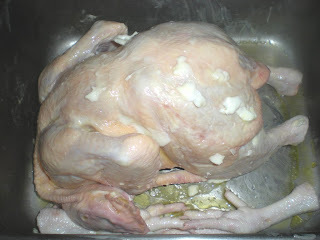 There was an unfrozen whole chicken at the sink, neither me nor my bro knew how to cook a whole chicken, probably it was the fear to overcook or dry the chicken. However, both of us can easily cook chicken wings and chicken breast. I said to myself, I have to cook a whole chicken at least once in my life and I manage to do. It was the juiciest chicken I had ever tasted. The simplest cooking method is by roasting. 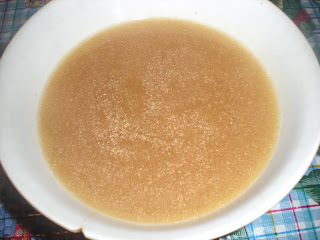 I also made a gravy out of it too since we had some chicken stock left in our fridge from the risotto I made last week. 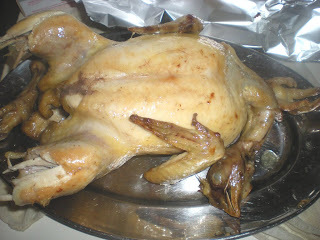 So, there is nothing to fear about cooking chicken, if you cook it correctly, it should be all fine. 2. In a roasting pan, drizzle chicken with oil, then rub on the butter. Season with salt and pepper inside and outside of the chicken. 3. Place chicken, breast facing up. Pour in the water, and put the roasting pan into the middle of the oven. Roast for 15 mins, then reduce heat to 375F. Roast for 25 mins longer. 4. Remove from oven and baste chicken with the juices in the pan. Turn over onto its breast. Baste the chicken again, then continue roasting for 25 mins. 5. Turn the chicken onto its back and test for doneness. Insert a toothpick or skewer to parts that are less likely to be cooked through such as the thigh or thick end of the breast. If there are traces of blood, continue cooking after 10 mins and test again. 1. Using a large spoon, skim off the fat from the pan juices. Put roasting pan on the stove over low heat. Mix 2 tbsp of cornstarch with 1 tbsp chicken fat. Whisk it with the remaining pan juices. 2. Add chicken stock or water, increase heat and bring to a boil, whisking constantly. 3. Strain gravy into a clean bowl. Serve with roasted chicken. Mmm, a classic, but so delicious! I love it when we roast a whole chicken at our house: the leftovers keep us alive for days, and we make stock with the carcass. Nothing goes to waste!